DOKMUS is a fast-paced board game with a constantly changing board. The game board consists of eight pieces that players can move and rotate. 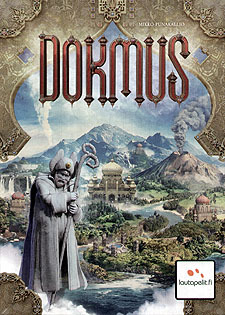 The goal of the game is to spread your tribe's influence and gain the favour of Dokmus, the ancient god. Ignore the theme and simply enjoy the intricacies of this aesthetically pleasing token placing game. With a set of double-sided tiles, you create a play area of 3x3 tiles, omitting the centre tile. Each tile consists of open land, woods, mountains, volcanoes, water, temples and ruins. Each turn, a swift drafting of up to five special pieces determines both play order and a beneficial ability for each player. You then place three of your wooden tokens in order to score points at the end of the game for the number of temples your tokens are adjacent to, ruins you occupy and tiles that you have tokens on. But beware those special benefits allow players to do such things as rotate a tile by 90 degrees, move the position of a tile or one of the active player's tokens. The whole ensemble is hugely pleasing to the eye, easy to grasp the mechanics of play, but fiendishly teasing and difficult to master, as your opponents' actions with create a constantly changing configuration of the board. Not to be played with those who want to analyse interminably each and every potential move, placement, turn of a tile or choice of player order.